That's a great find! RAO 60x1000! That was their top of the line 60mm back in the day! Congrats! OK, in keeping with the "Look what I found and bought" theme: I picked up a 1969 Tasco 7TE-5 last Saturday at a little shop in Milwaukee for $75.00, off a Craigslist ad. It is complete except for the manual, and it's in GREAT condition. The only issue is the typical veneer problem on the box lid. Compared to the majority of the wooden boxes, the veneer is actually in good shape. It looks like you could carefully glue the veneer back down and not have to replace it IMHO from what I see in your photo. Hello Lars, do you see a gold or silver oval passed inspection sticker on the bottom side of the focuser housing? Dec drive doesn't work? Looks like an Armstrong brand dec drive to me! Great price! I wish I could find an original mount for my 10" DK. I removed the Armstrong Dec Drive and fitted on an old Meade Electric Tangent Arm in its place. Found it locally. Seems to work okay, but I'd still like to get Cave Worm/Ring Gear Dec Drive for it. I'll probably sell the Armstrong Drive on eBay and get lots of $$$! 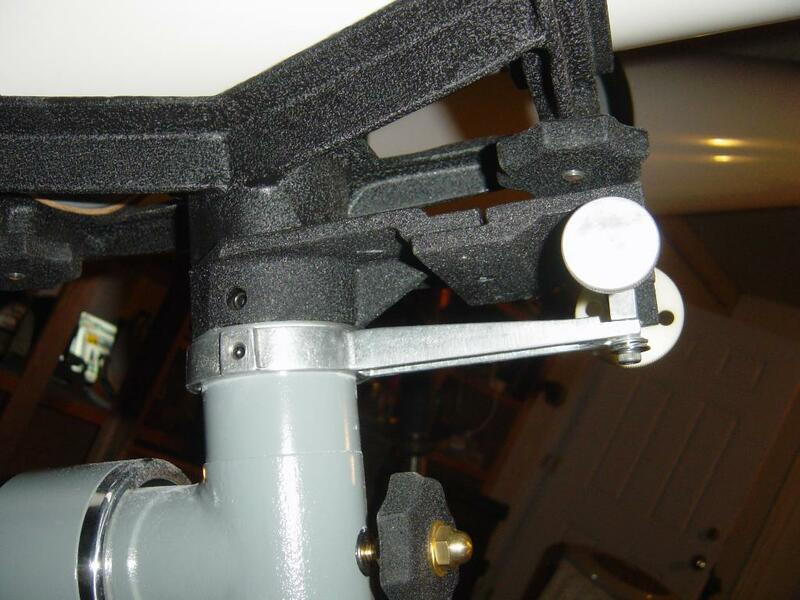 For the Cave Cassegrain mount - aren't they the same as a Newtonian mount except for the longer Pier Column? What is the significance of a silver sticker vs. a gold one? The gold oval sticker was used 1966 thru 1972. Then JTII began using the silver stickers in 1973...I believe early 1973 till the end of 7TE-5 production sometime around 1977. Based on scopes I've documented the serial numbers beginning with the 960XXX thru 963XXX appear to cover roughly 1969 thru 1977 7TE-5 models +/- a half year. I've not be able to stumble across a silver stickered 7TE-5 out of 65+ ones I've seen. I believe they will be on serial numbered 963XXX scopes. If someone has a 963XXX, let me know if you have a gold or silver sticker. The color & shape of the JTII sticker helps with an approximate date for the scope - especially when there's no serial number, or any dated publications included with the scope. Based on your 7TE-5's s/n, I'd say it's from 1969. Stephen, my 6336 came with two JTII items: The Gold Seal on a paper wrapper around the 6x30 finderscope; and, a larger Pendant (maybe hung from the OTA with a string? ), with the number Y480914 on it. In terms of dating: The 6336 had to be made on or before 1965, as these models were offered by Sears in the 1964 & 1965 catalogs. Yet, going by the RAO S/N, it was made in 1962. Lars, I created the Registry to try and pin down some of these questions, since the scopes are often missing documentation by the time we get them. I figured that with enough data, analysis would be easier. As of right now, we have close to 400 entries on the refractor tab. If we can establish a solid correlation between S/N's and dates, then we can identify trends - like peak production years for a particular brand and/or model. There are already enough entries to see what models were most popular, and which ones are rare. Hello Bob, correct the 6336 first appeared in the Sears Fall 1964 catalog, and last in the Fall 1965 catalog. And possibly in both the Xmas 1964 and 1965 Wishbooks...I believe it was the 1964 Xmas Wishbook for sure. 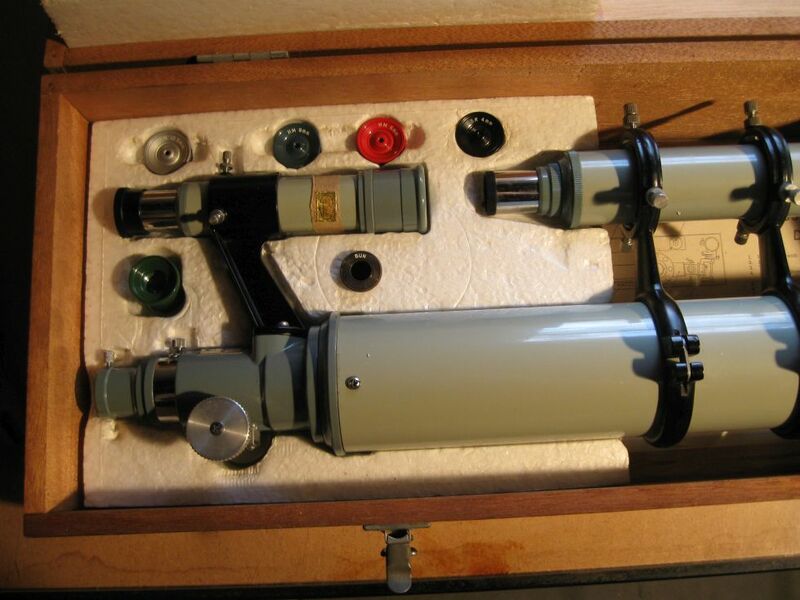 With respect to the serial numbers, so far out of 500-600+ Royal Astro branded telescopes.....I've yet to come across one 60mm or 76mm scope with a 3XXXXX or 4XXXXX serial number. 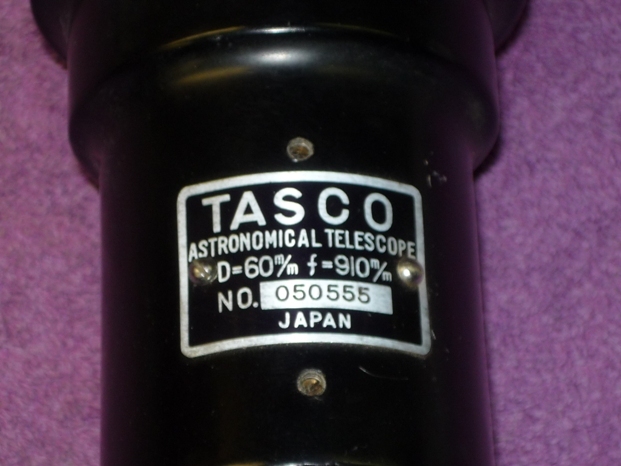 Based on documented Tasco and Sears plus Tower Royal scopes using the sales catalogs plus Tasco REG NO's...the 1963 and 1964 models all have 2XXXXX serial numbers. 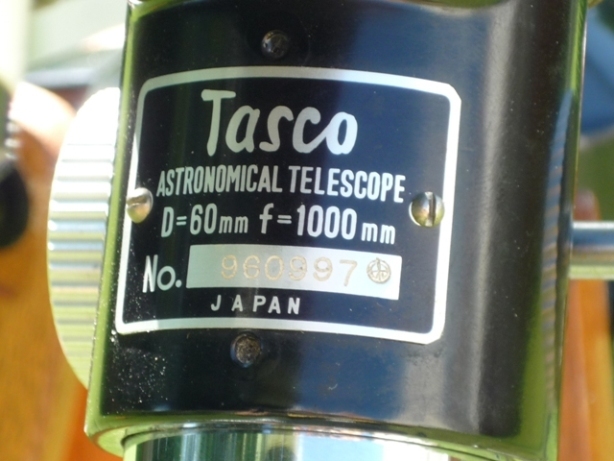 Tasco started using 5XXXXX serial numbers sometime in 1965. Sears first 5XXXXX Royals are the 6339-A that are first listed in the Spring 1966 Sears Catalog. It appears all the 1963-1965 Sears 6335 (non pedestal 6336) all had 2XXXXX along with the 1962 gold Tower 6335. 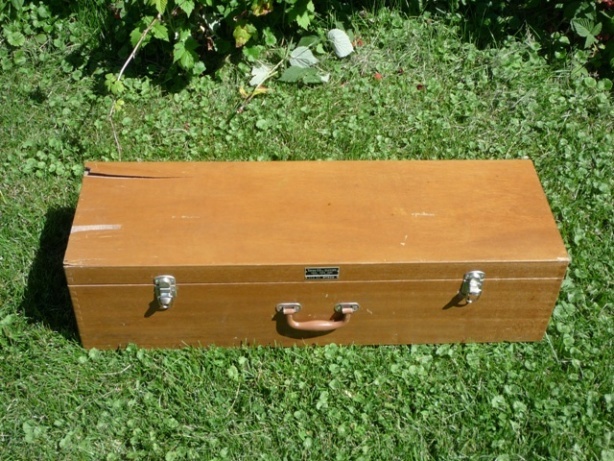 I believe your larger round JTII passed cardboard tag was taped inside the upper lid of the wooden box. You should see a place where the dried tape residue remains. Okay, so the S/N's correlate to a date range, and not a specific year. I'll go back through the Registry, and correct entries as needed. I'm at work now, but I'll check the 6336 case later today. A previous owner had gathered all the paperwork together in an old manila envelope, including the JTII tag, but I'll check for a sticky spot. Actually, I'm just glad all that printed material was kept! The mount head is the same. Yes, but the saddle would have to be for a 10" Newtonian. Cave was clever that way. The customer would have to buy a whole telescope if he wanted a different aperture. Parks and Meade modified the saddles to be flat with interchangeable radius blocks for different otas. Just opened a Cometron by Celestron CO-60 that I bought this week by auction. It's alt-az, with no slow motion controls, but the tripod legs are wooden. In the original box, with all of the Comet Halley instructions and the Cometron catalog. Plus the Rand 42x37 Moon atlas, unopened. I got this for the price of a movie night, or less. 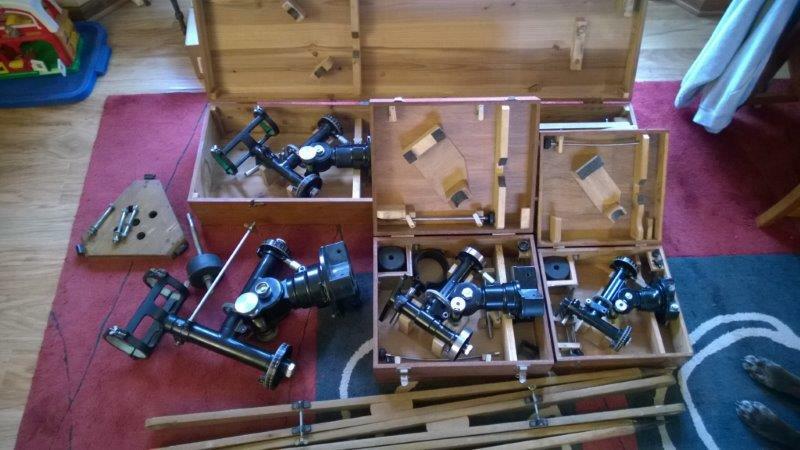 I'll have to test the objective, of course, but it came with the two original Celestron .965 Kellners, 10 mm and 25 mm. They look new. It also came with a Celestron 90 degree prism and two 45s, all Japanese. Plus a Meade 6 mm ortho and an Orion 18 mm. And a Barlow. And a long tube marked "T 18" that I can't ID. In any case, I think it was worth the risk. Sometimes, the best part of the find is what's in the goodie box! The T-18 eyepiece is for terrestial use (without the diagonal-that is why it is so long) and gives correct image plus it can be used by itself as a low power microscope to examine stamps and coins. Congrats on a nice scope find. Thanks for the info. That's what I figured, because of the way it's made, but it's good to have confirmation. I hadn't read thru the instructions yet either.